In the 2000 U.S. Census, Oakland County, Michigan, was by one measure the fourth-wealthiest in the U.S.; although the county slipped somewhat in 2010, Bloomfield Hills – its most prosperous section – remains one of the most affluent half a dozen suburbs in America. This is the terrain of exclusive country clubs and private academies, where the multi-millionaire presidential candidate Mitt Romney went to school, and banks advertise openings for ‘Wealth Relationship Associates.’ Cross its southern border – the 8 Mile Road – and you enter Detroit, which yesterday became the largest ever U.S. city to file for bankruptcy. With debts of $15bn, 70,000 abandoned properties, and well over a third of its residents living below the poverty-line, the Motor City stands in stark juxtaposition to its well-heeled next door neighbour. Detroit’s fall is well known. In the early twentieth century, its automobile executives pioneered a new form of mass production in which workers provided a market for the goods they produced in the vast factories of Ford and General Motors. In the New Deal, those same workers forged strong unions which secured rising living standards, and when the nation entered World War II, they switched from building cars to tanks, transforming the city into ‘the Arsenal of Democracy’. Then decay set in. Capital moved elsewhere in search of cheaper labour, manufacturers struggled to adapt to foreign competition, and big construction projects like the Renaissance Center failed to arrest the decline. By the mid-1990s, the photographer Camilo José Vergara suggested in all earnestness turning much of the downtown into a ‘skyscraper ruins park’. 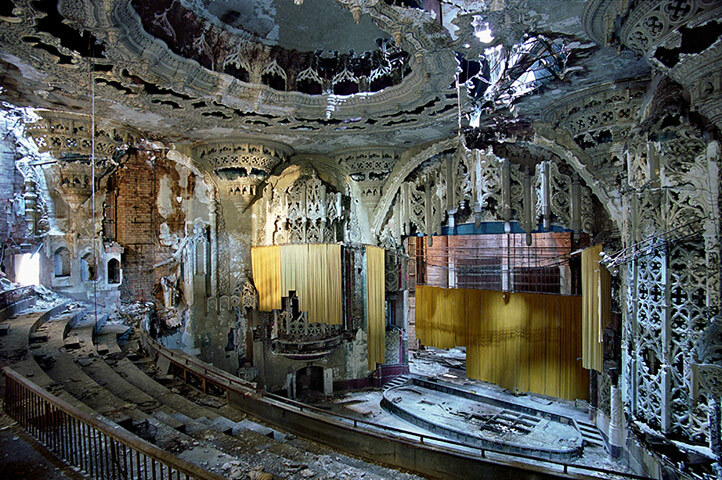 While his proposal provoked civic outrage, Detroit today has become a kind of modern ruin, which draws appreciation from aesthetes who sometimes forget the city still provides a home to 700,000 people. As taxpayers, municipal employees, and users of public services, they will be the first to suffer from its financial collapse. But as well as plotting Detroit’s fall through time we should also do so through space. The postwar era was the golden age of suburbanization in the U.S., as highway building, cheap mortgages, and new construction methods encouraged flight from the city. Detroit’s white working-class followed their bosses by decamping from the factory districts. Until the early twentieth century, big industrial cities responded to suburban expansion by annexing outlying neighborhoods, capturing their tax revenue and ensuring a measure of metropolitan government. By the 1950s, however, the incentives for annexation were gone. New suburbanites were more interested in keeping their terrain free from African-Americans – who had flocked to Detroit to find work in industry – than they were in uniting with an increasingly black, poor city; mortgage-lenders turned down black applicants while whites violently resisted the integration of the real estate market. As Thomas J. Sugrue has argued in his Bancroft Prize-winning book The Origins of the Urban Crisis, to understand Detroit’s fate we need to grapple with the racial politics of housing and suburbanization as well as structural shifts in the economy. The 8 Mile Road – which gave its name to Eminem’s 2002 film – is in this regard much more than a symbolic divide. It is a real boundary between a city with a declining tax base and majority-minority population and a more-or-less affluent, predominantly white county boasting some of the best school districts in the U.S. Suburbs prospered as Detroit declined. Historians need to be careful in generalising about American suburbia. The ‘New Suburban History’ has shown that suburbs are anything but uniform in character, and many have been hard hit by the recession; Bloomfield Hills’s affluence is the exception rather than the rule. But cities’ inability to share in the prosperity of their peripheries is one reason they run into financial hardship. I see this in another declining industrial center, Philadelphia, the city much of my work has focused on. In 1854, Philadelphia annexed its outlying suburbs to become, in territorial terms, the largest metropolis in the U.S. – a position it retained until the late nineteenth century, when it was superseded by Chicago and New York. By the early 1900s, though, wealthy citizens had moved beyond the vast city limits to railroad suburbs like Lower Merion, where the U.S. Open was recently held at an exclusive golf course. Today, the boundary where Philadelphia’s grid gives way to the meandering curves of suburban streets is easy to discern from the train. On the one side stands rows of small, dilapidated houses; on the other, visible signs of prosperity. Philadelphia faces similar financial problems to Detroit: the city has just shut 23 schools. It’s worth taking a look on a renowned user-edited website at a page on the largest cities in the U.S. by area. The likes of Philadelphia and Detroit – once the drivers of the American economy and still among the biggest metropolitan regions by population in the nation – fall well behind obscure outposts in Alaska and boom towns in the Southwest in square mileage. These new cities need to expand in order to bring municipal services, especially water, to their outlying areas. The possibility of older industrial cities doing the same today is slim. States have the power to create, destroy, and amend city governments, and legislators would face a backlash from suburban voters if they tried to saddle them with the municipal debt of the urban core. Oakland County’s wealth may have come from Detroit, but don’t bank on it bailing out its neighbor on the other side of the 8 Mile Road. Andrew Heath is Lecturer in American History at the University of Sheffield, specialising in urban history, particularly 19th-century Philadelphia. You can see Andrew’s other History Matters blogs here, and find him on twitter @andrewdheath. Who knew the largest city in the U.S. by area was Sitka, Alaska? Hi Felicity. That would be one way to put it. The more generous response might be to emphasise the strong tradition of local self-government in the U.S. – a tradition I’ve always found admirable. The racial politics I mentioned above shouldn’t be ignored – this is perhaps the main point historians writing about Detroit have highlighted over the last few years – though unlike the South, segregation in northern cities often rested on extra-legal measures: mortgage red-lining, citizens’ committees fighting black migration and so on. Hi Andrew, you obviously know so much more than I do! But the view of the US from over here so often seems to be that the weakest go under, especially these days. It is such a huge social experiment, with such a mix of different cultures. However, as history shows, the strongest social structures are often born in adversity so we can only hope that Detroit will be a latter day Phoenix. Congratulations by the way – very well deserved, it was a privilege to be taught by you.